My wife and I love to sit in the backyard on the weekends and watch the hummingbirds zip around our flowers and feeders. Male hummingbirds will lay claim to a particular feeder and dart after rivals. In fact, a couple times these skirmishes have flown so close to our heads, I wonder if the two little missiles even saw us. I have never known anyone getting hit by a hummingbird, but I’m sure it hurts. 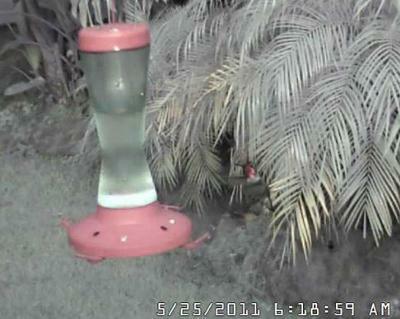 Sitting in the backyard last summer, we started talking about setting up a hummingbird webcam so we could enjoy the hummingbirds during the work day. It seemed like a good idea, and after months of procrastination, I finally ordered a camera. The camera arrived, and after a few adjustments, I had it working. What a surprise! The picture was reasonably clear and the camera came loaded with all kinds of neat features. 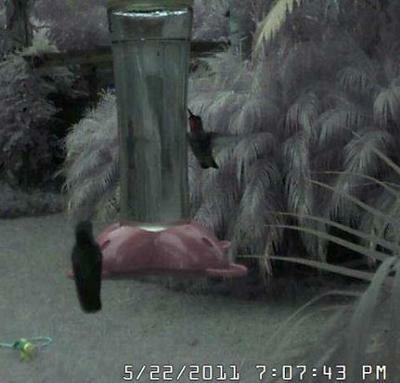 From a computer or smartphone, I could pan, tilt, zoom the camera on a feeder. The camera had a mini speaker that I could turn audio on or off, set the camera to record video clips, set motion detection or night vision. This was awesome! 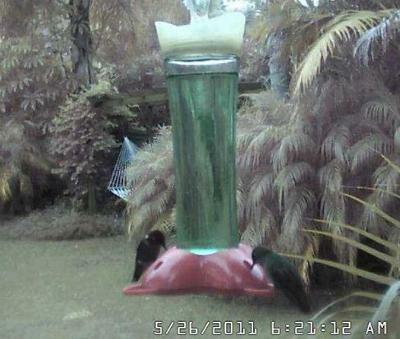 I could watch hummingbirds sipping at a feeder from inches away without disturbing them. It was like National Geographic in a box. I needed another camera! You can view my hobby at the following site http://www.hummingbirdport.com. Currently I am using Foscam wireless IP cameras (both outdoor and indoor models). 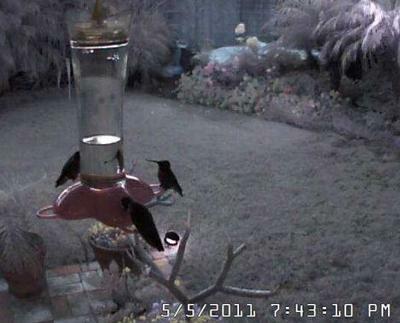 We have mostly Anna hummingbirds with an occasional Hooded Oriole. Best viewing times are early morning and late evenings. Attached are my favorite webcam photos from May. Enjoy!